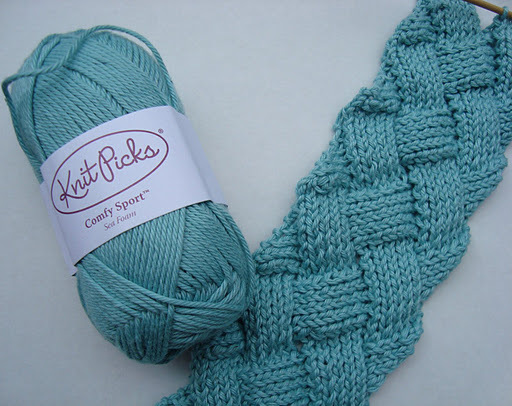 Have you ever looked at a knitting pattern and just sighed and thought, “That is sooo pretty but I’m sure that technique is waaay too difficult for me?” That is exactly what I thought looking at all things Entrelac…scarves, totebags, felted tote bags, sweaters….so pretty and, I was so sure, much too difficult for me. Then, through the magic of Twitter, I saw @sweatshopoflove’s The Loop Entrelac Top. What an adorable summer sweater! I queued it when it went on Ravelry. And there it sat for a year, a whole year! Really cute, right? Well, I have never tried knitting anything Entrelac and that diagonal, diamond-shaped, basketweave pattern was more than intimidating! But then I saw (again, on Twitter!) that Allyson was having a summer sweater knitalong and one of the selections was this very sweater! I was in! The time frame was June 1st to July 31st….more than 8 weeks plus Allyson made a how to knit Entrelac Video!!! Her written instructions are very easy to follow and the video is terrific! Just so you know, Entrelac is basically just knit stitches, purl stitches, knit 2 together, purl 2 together and picking up stitches….really easy stuff! So, despite a busy summer, waaay too many projects on my needles, and a lingering fear of this new technique, I finally cast on The Loop Entrelac Tank Top last week. As of right now, I am almost done with both Entrelac straps! I should be onto the main stockinette sections tonight! And, PS, since this sweater is for my daughter, I made the straps a little short and put them on stitch holders so I could get a perfect length for her. Actually, I’m hoping I have a few more sections of Entrelac to knit! Do you have any knitting techniques that you’ve been afraid to try? Share here!